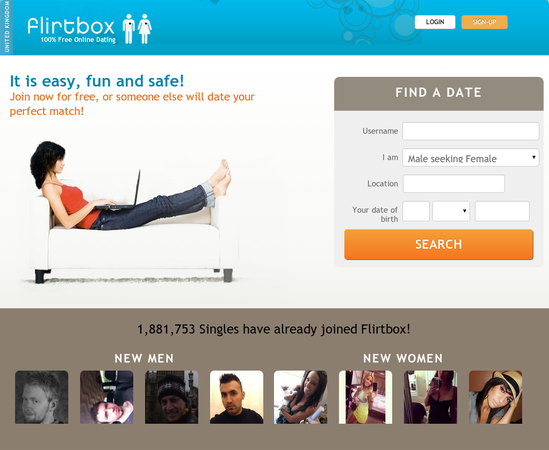 Flirtbox.co.uk: is a free UK dating site with an online platform for local singles to meet, greet, and flirt online. Flirtbox.co.uk is simple, straightforward and free UK personals site – hugely popular. The number of members on flirtbox, likely because of its genuine “freeness” is fairly impressive at around half a million in the UK. There platform is really about online chatting and socializing, targeting people who are seeking a partner to settle down with as well as a younger crowd just looking to interact and meet online. To help encourage this, Flirtbox offers a number of interest-based groups to members where you can meet like-minded people. Flirtbox allows you to get started developing a profile and searching for a good match within seconds. No need to setup a membership subscription and start paying fees first – just sign up, confirm your email, and start messaging. Of course, as a free site, you will encounter ads and empty profiles. For a free dating website, flirtbox.co.uk has some great features. The functionality of these features is, however, still up for debate. Here are some of the features that you can expect to find on flirtbox.co.uk. This is a way to let you rank women that have caught your attention. You can have a list of profiles that you like, and talk to them when you have the time. This is a great idea since you might not be too sure about a particular profile. You can put it on your ‘my favorites’ list and come back to it later. Women that have given you positive responses can also be put on this list. This is a very functional feature to have on a dating site. This feature simply lets you block users that have been rude or seem dodgy. This is mainly to protect you from an unpleasant experience or worse. You might, however, find that like on many free dating websites. Your block list will be quite extensive. Flirtbox.co.uk members are not exactly known for their charm and class. This is another carefully thought out flirtbox.co.uk feature that is designed to help you find a perfect match. This section should give you a good idea on what the girl you have been eyeing is really like in person. You can also get to know more about other members on this section. It is no doubt a helpful feature, and could save you a lot of trouble and disappointments.